If you ride horses, your saddle is arguably an essential piece of equipment you own. They’re an investment, and when they are taken care of properly, they will last you years, and only get better with age. However, since it is between you and the horse, is outside, or in a dusty barn means that your saddle gets dirty quickly. Here are some top tips to clean your saddle to keep it in good shape and make it last longer. Sweat and saliva can damage leather. You use a saddle pad underneath the saddle for your horse’s comfort, but it can also protect the saddle from your horse’s sweat. You’ll want to check your saddle every time you ride to make sure no sweat has soaked through, and wipe the main areas down after each ride with a slightly damp sponge, especially the girth. If you only ride once a week, you can get away with cleaning your saddle with cleaner every month or so, or as needed, but if you ride more often, you should clean it at least once a week. To clean your saddle, wipe it down with a slightly damp sponge, then follow with saddle soap. Use a toothbrush in saddle soap to get any dirtier bits or places that are harder to clean. Wipe the saddle down with a dry cloth once clean and apply conditioner when needed. Don’t over-condition your saddle or you could make the leather limp. Some pieces, such as the billets your girth is attached to, could fail if they are too weak. Store your saddle correctly to keep it in good shape. Never stack saddles, store them individually on a padded saddle rack, preferably covered to keep off the dust. Try to store your saddle in a climate-controlled room. When a saddle gets too hot, it can crack, and too much moisture can cause mold. Also be sure to store your stirrups correctly and don’t throw them over the top, as they can dent the leather. If your saddle gets wet, clean it immediately as the water can leave marks, and let it air dry. Once in a while, it is essential to deep clean your saddle. This is especially important if you are using it in a competition, wish to sell it to someone else, or you are going to store it for extended periods. This also applies to cleaning a leather bag. Start by removing everything you can from the saddle. This includes stirrups and all buckles. Like the regular cleaning, dampen a sponge and add saddle soap. Make sure you get all leather parts of the saddle including between flaps. Don’t get the saddle too wet, as that can damage the leather. You can buy special saddle cleaning sponges that are gentle enough for the saddle. Wipe off all soap with a very slightly damp cloth, using cotton swabs to remove soap from tiny crevices. Making sure you remove all soap residue is important. 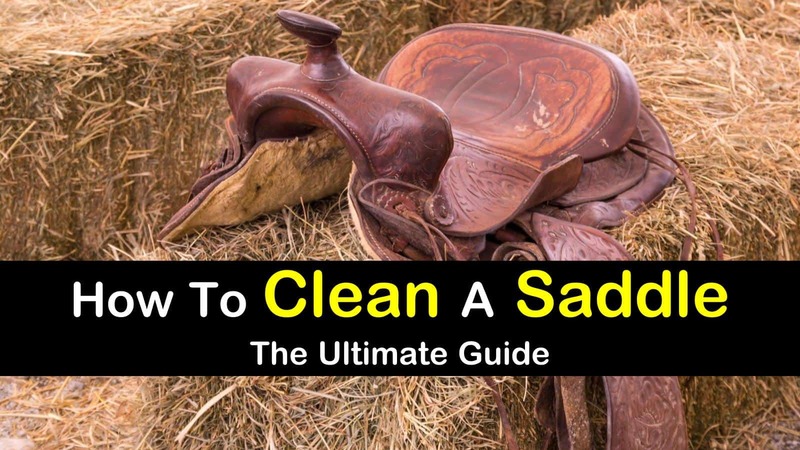 Finish by wiping the saddle dry. Condition your saddle with a suitable leather conditioner, very sparingly. Too much conditioner can be a problem. Finish by using a metal cleaner on stirrups and buckles, careful not to get it on any leather parts. If your saddle also has any parts that are suede, you can use a stiff brush to refresh it. Reassemble your saddle. 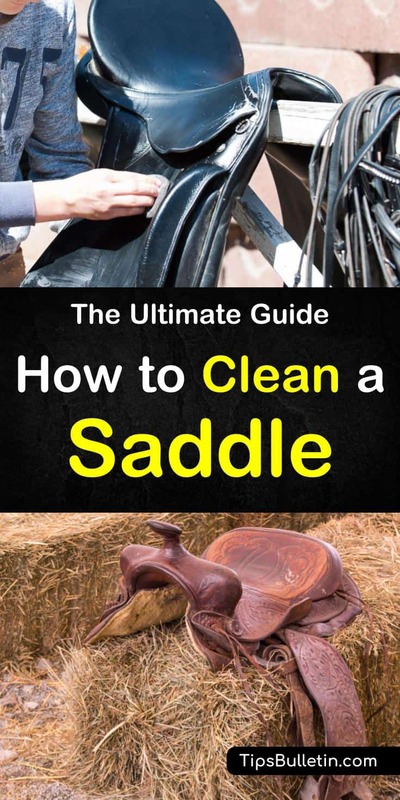 The same method can be used to clean a Western saddle as an English one. You might want to use a toothbrush for more detail if your saddle has more intricate leatherwork. Take this time to also clean all other accessories such as your bridle and saddle pad. Clean and condition the leather of the bridle and wipe down the bit. To learn how to clean a dirty old leather saddle, or one that isn’t in the best shape, follow these instructions to make it as good as new. Using a small leather cleaning brush, take one section of the saddle at a time and clean in every nook and cranny. Lather up the cleaner and scrub until the lather stays white, repeating if necessary. Take your time and make sure you get every inch of the saddle except any parts that are suede or a different fabric. Brush these areas with a stiff, dry brush, and sprinkle cornstarch if you have a particularly dirty area. Polish the metal parts of the saddle with a metal or silver cleaner, apply it to a rag so you don’t overspray onto the leather. Use the same technique to oil the saddle, applying saddle oil to a rag and applying to smaller areas. You can spray oil onto the seat or other large areas. Rub the oil in, be sure not to use too much. If your tack room is not climate controlled, or your saddle has been in moist conditions, you could be at risk for mold. On leather, mold shows as a powder that is green or white, and it can damage the leather long term. If you have found mold on your saddle, mix one part water with one part rubbing alcohol and wipe your saddle down. As alcohol is very drying, condition the saddle again afterward. Let air dry completely and store in a room without a lot of humidity. Regular cleaning and drying will usually keep mold away. The best saddle soap is made of glycerin. This is found in a lot of bath soap as well because it is humectant; it holds onto moisture. As leather is skin, keeping it hydrated is critical. Oil soap is made from vegetable oil and is another type of cleaner. Made from sheep’s wool, lanolin is a popular moisturizer. It is waterproof, so not only can it be used to condition your saddle, but it will also protect it from moisture. You can also use linseed oil on leather. Made from lard, pure neatsfoot oil is also a popular leather conditioner. It used to be made from cow feet and legs, where it got its name, as ‘neat’ is an old name for cows. When using neatsfoot oil, be sure it is pure oil and not a blend, which sometimes contains mineral oil; mineral oil is not good for saddles. Neatsfoot oil can darken the color of some leather, so be wary of that.